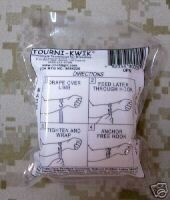 The Tourn-Kwik TK-4 tournequette is designed for quick effective application of compression control for bleeding in extremities in trauma situations. Easy application and use, even one handed application by the injured individual, when necessary. Strong elastic strap( 3" X 40") with attaching hooks can quickly and effectively be used to apply variable strength compression control of bleeding. Sterile individual packaging.